You are here: Home » Posts tagged "fundraising"
Here’s another one to add to the fundraising with children list… as I’m sure you’ll agree, it is very much needed at the moment. 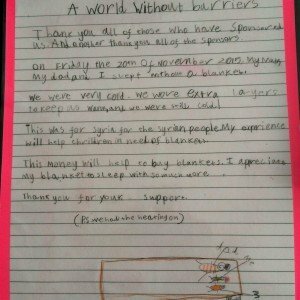 The idea is: Sleep Without A Blanket – not only will this give children a tiny glimpse into what it is like to be a child sleeping without a blanket in the winter, but also raise awareness of the struggles that other children are facing at the moment. Here is one example of someone doing this challenge, although I know there are many out there. Do donate if you can! 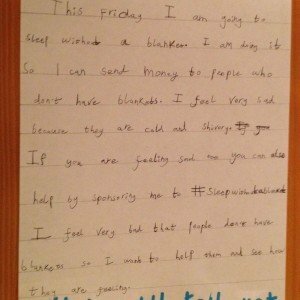 And here are some oh-so-cute letters written by other children taking part! Remember our Fundraising Series not so long ago, where we shared ideas to encourage children to raise money for other children in need? 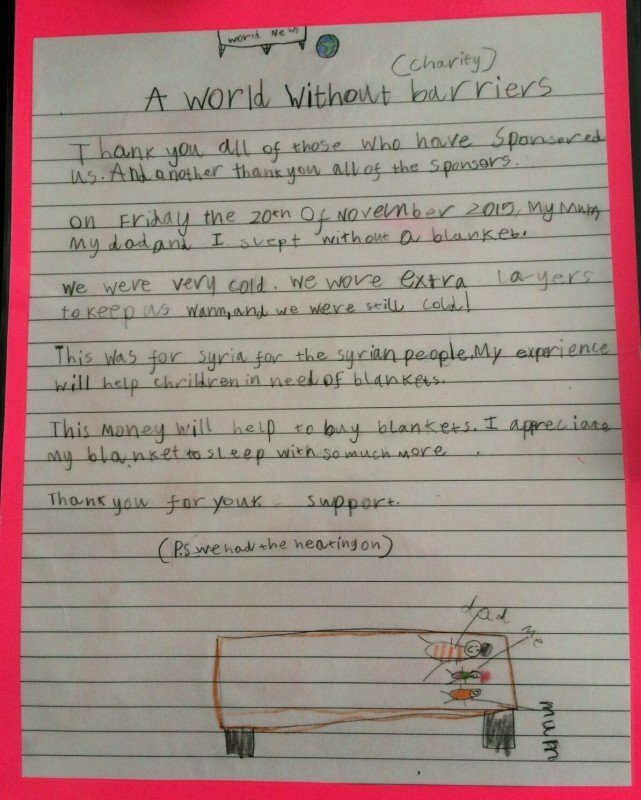 Here is another super example: the Students for Students Appeal. It’s oh-so-simple: the children collect sponsors to either recite a Tasbih, a Sura Fatiha or a Sura Yasin for their Marhumeen’s sawab. The money all goes to helping equip labs in a girl’s college in Pakistan. The potential for learning here for our children is immense – appreciation of the fact that they have all the facilities which they may take for granted, the opportunity to send blessings on their Marhumeen, the chance to recite a Sura (etc), the chance to save up for their Aakhira through Sawaab-e-Jaariya…the list is endless. Why not have your kids take up the challenge? The sponsorship forms are all on the link below, as is more information! Fundraising Series on World Federation News! Last one for this series! “So the Eid toy drive was an event where we called on and invited families to bring a brand new gift to be donated to local families in need. The gift would be wrapped at the event. The children would make a Eid card to accompany the gift. Finally they would receive a small prize or memento for their participation. We worked with Islamic Relief (which is the main sponsor of the event) and the organizations they work with in the area. The gifts were labeled by gender and an approximate age the gift is suitable for. This would be cross referenced with their list of families and the children in each family. A great idea – Inshallah one to implement next year?! So this one is not just for children (husbands pay attention!) but as you can see from the pic, is SO thoughtful coming from a son/daughter! On Eid day here in Stanmore, they have started a tradition of selling roses to those who attend Eid namaaz – all profits go to charity. This year they offered a personal touch by including the option of buying a Buzz Ideazz card too! With only 500 roses and 200 cards, they managed to raise £2500 which I think is pretty amazing! Definitely an idea for other communities to implement Inshallah? At the end of the month, teachers of classes are usually given lots of little presents to say Eid Mubarak and thank you. That is a wonderful wonderful gesture and token of appreciation, but this year some organisers of classes had an even better idea! They suggested that the children donate on their behalf instead . The kids and I still felt we wanted to acknowledge them, so we made these little mint books – the pics say it all I hope! They personalised it by decorating the front and then handed them out to their teachers as well as donating in their name too. P.s. This idea is thanks to pinterest of course – here is the link to the much more professional looking ones! They raised more than £60 for Gaza! The children, who had just received cash for their Shahr Ramadhaan efforts spontaneously rose, one by one, to return their gifts as donations to the Education Fund! 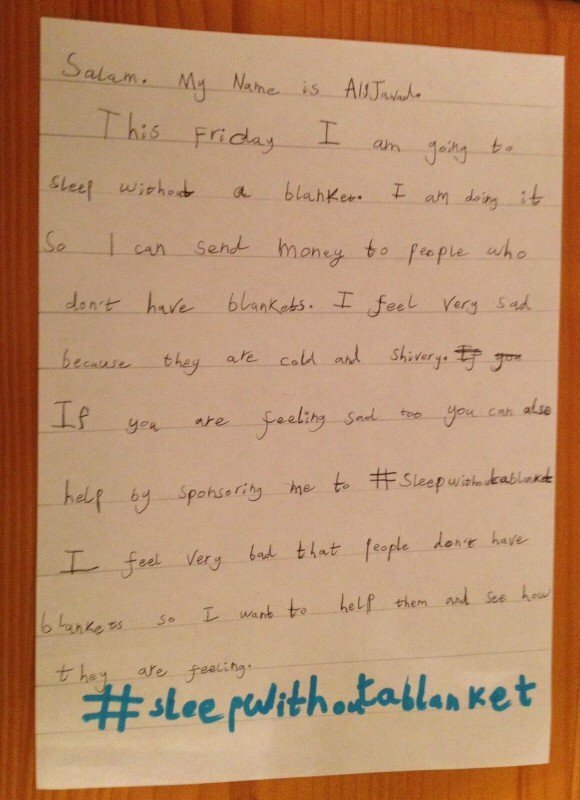 This is fantastic selflessness from the children and should be commended. The whole jamaat was very moved by this action from such young kids. Fundraising Idea 17: Have a lucky dip stall! Sara Zaynab had a very successful lucky dip last Ramadhan and she’s doing it again this year! Good luck for this Monday Sara Zaynab! “We will be selling these Washroom Packs at mosque tonight. A laminated ghusl card for in the shower. A laminated wudhu card for beside the sink. A laminated washroom door sign. You can use these in your homes as daily reminders. Please support us in raising funds for Palestine as every penny raised will be donated.